Customers at a Houston Petco were left stunned Monday when an unusual and very large animal arrived at the store with its owners. Vincent and Shelly Browning decided to test the franchise's famous policy that 'all leashed pets are welcome' by bringing along their 2,000 pound African Watusi named Oliver. 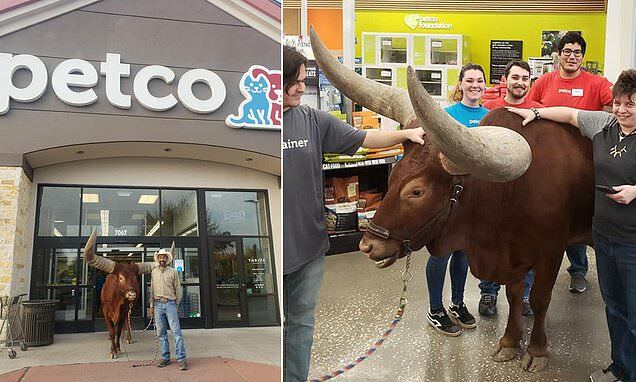 The pair were pleasantly surprised by Petco's friendly staff, who quickly welcomed the gigantic steer with open arms. A video shared to Facebook shows Vincent walking Oliver into the store, located in the suburb of Atascocita. In the clip, the one ton animal tilts its head to allow its large horns to pass through the shop's automatic doors. Immediately, enchanted employees were seen coming up to pat the placid animal, while customers whipped out their smartphones to take photos of the memorable moment.